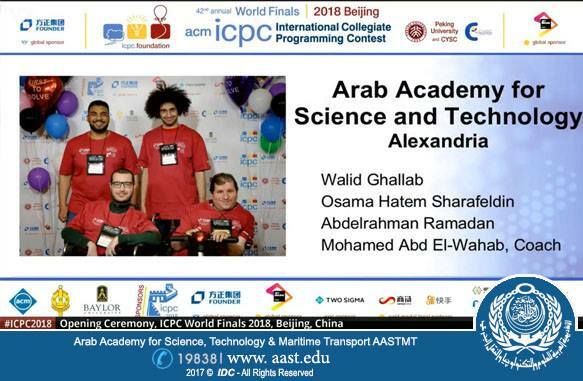 The Arab Academy for Science, Technology and Maritime Transport (AASTMT) won the World Impact Award during the ACM International Collegiate Programming Contest (ICPC) that is the premiere global programming competition conducted by and for the world’s universities. ICPC 2018 was held during 15 - 20 April 2018, at Beijing University – China, as the award was received by H.E Dr. Yousry AlGamal – Former Egyptian Minister of Education - AASTMT President Consultant, Dr. Osama Ismail - Dean of AASTMT Regional Informatics Center and Eng. Mohammed Fouad - Regional Director of the International Collegiate Programming Contest (ICPC) for University Students. It is worth mentioning that AASTMT represented in the Regional Information Center had organized the regional contest for university students since 2007, where the maximum number of participants in the Arab region was 66 teams representing 27 universities as AASTMT published the Programming education, methodological solutions and computer algorithms in the region, as the number of participants in the regional contest had reached 1036 teams representing 191 Arab universities from 9 Arab countries. Also, it should be noted that the first Informatics Olympiad in the Arab region was also organized by AASTMT Regional Center for Informatics.